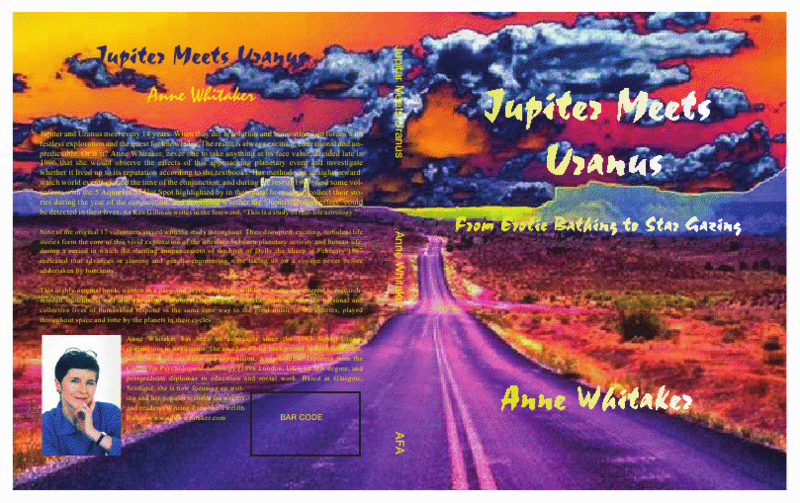 This entry was posted in Jupiter/Uranus conjunction 2010/11, Phase 1: 8th June 2010 (6 articles) and tagged 2010/11 Jupiter/Uranus conjunction, geological forces, Jupiter meets Uranus 2010/11, Jupiter-Uranus conjunction in Aries June 2010, Jupiter/Uranus conjunction 2010/11, outwith human control, The Cardinal Cross Summer 2010, upcoming Jupiter-Uranus conjunctions in Pisces and Aries., wider solar system. Bookmark the permalink. it jumped out at first sight, and, with all the focus on the orbiting big hitters in the chart and their heavily aspected dance, I can’t help being drawn back to this seemingly anomilous feature – surely we can’t ignore the old fella…! great to hear from you and thanks for the compliments! Wit and fresh air are very necessary commodities in these tempestuous days and I am flattered that you think I provide a bit of both.Yes, you are right. There is a very wide applying square between the third house Sun and sixth house Saturn and that’s all. 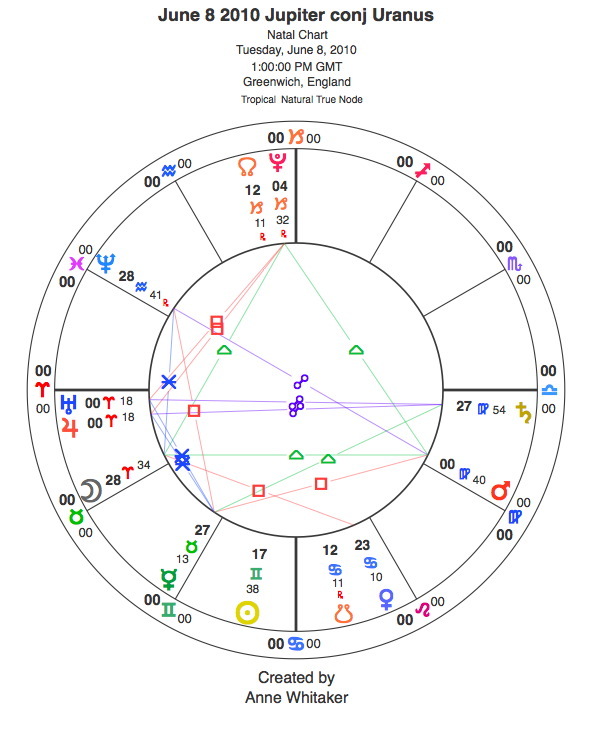 I haven’t looked into the deeper structures of the chart – midpoints etc – partly because I’ve been too busy writing all those articles! And because like everyone else I’ve been so mesmerised with the’big heavies’. I think your interpretation is a good one – and the Sun with only a weak aspect to Saturn may indicate a collective difficulty in assessing the upcoming energy pattern in a rational, measured way. Let’s put it out to the readers, shall we? What are your thoughts on this, folks out there? Hi Anne and thanks for the encouragement – what I find much more scary than the actual astrology is a novice stepping across the threshold into such esteemed and sage company…..
but, hands up to the aries traits, here we go again…. As an Aquarian (knowing Uranus) I lean toward the “bring it on!” side. Very interesting statistics Anne (I wonder how you got them). I wonder, of the 00.1% of humanity that are astrologers on this planet, what percentage of them are fatalistic astrologers (their own worst enemy), and how many of them are astrologers that recognise that we can use positive thoughts and feelings and work with the planetary configurations to steer our life in the direction of our fondest desires. While we are doing that, we are automatically contributing something helpful to the Universal Mind, thereby helping all of humanity with our thoughts. Once enough people become aware of and understand and support the new paradigm (which has been proven by quantum physics), this world will become a much better place for all of us. good to have you drop by again! And thanks for this thoughtful comment. My statistics are entirely made up – impossible to work out, so exercising a bit of imagination and poetic license. None of us will ever know the balance between fate and free will: I am much like you, in that I think knowing astrology gives us a brilliant opportunity to try and work with the energies that come our way so that (given our ever-present personal limitations) we may incline them to express at a level which is the best we can manage both for our own and our fellows’ benefit. It would be great if more people in our current cultural phase both knew astrology and were willing to work with it in this way. That would contribute positively to the paradigm shift which I also believe is slowly taking place in this time of great disruption and change. But the Greeks did not talk about the Fates for nothing. We need to respect that, realising that certain things we DO know about eg Icelandic volcanoes are entirely outwith our control. And there is an imponderable dimension to life, utterly beyond our human comprehension. We need to respect that even more. I like what Liz Greene once observed in one of her London seminars, to the effect that we should proceed as though we had free will, and would find out soon enough where we didn’t….